EXHIBITS GALORE - The record crowd of 60,000 people expected to attend this week's National Computer Conference in New York will have a choice of 1,700 exhibits to visit. 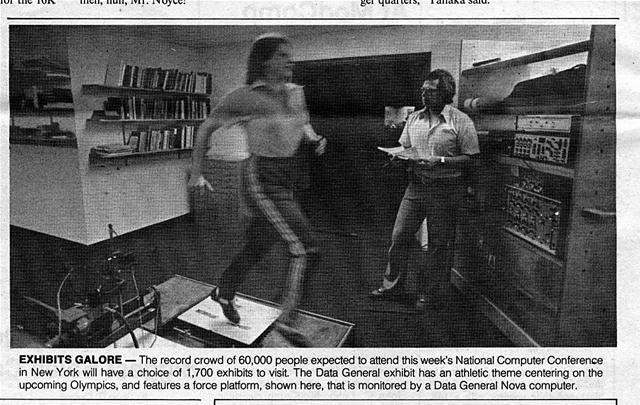 The Data General exhibit has an athletic theme centering on the upcoming Olympics, and features a force platform, shown here, that is monitored by a Data General Nova computer. Generated on 4/22/2019 8:54:54 PM (PST) ADI/HQ/GBA/2019/ARIELCLOUD/v3.0.2018.0126.